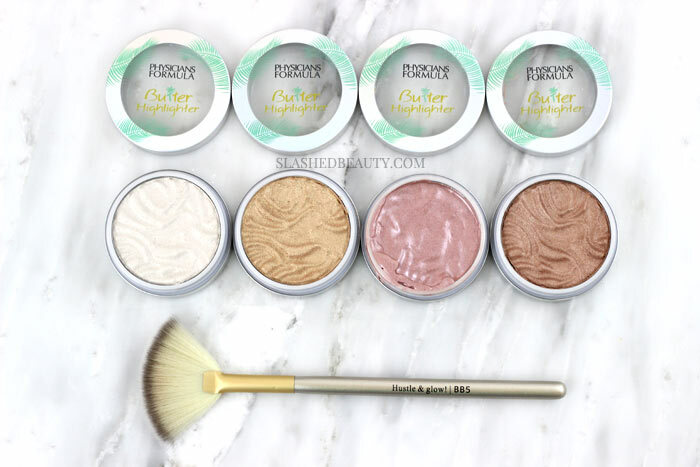 There are several reasons why the new Physicians Formula Butter Highlighters excite me. These were spotted a couple months ago for the first time in Harmons/Bed Bath & Beyond (side note— why do they get all the newest launches first?? It’s so random!) but they only just dropped on the brand’s website. 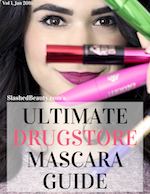 I’m thinking they’ll hit other mainstream drugstores by the holidays. I only recently found out they existed… better late than never with these, though! The launch consists of four shades, with one more coming as an Ulta Beauty exclusive in December (unfortunately I don’t have that one to share!). The original four shades, however, range from beaming white to deep pink. Right off the bat I want to address that this is the first Physicians Formula launch I’ve seen that actually caters to a pretty decent range of skin tones. The brand has been criticized online for their limited shades, but as you’ll be able to see later in the post, a couple of these shades would work well for olive and dark skin tones. Kudos, PF! The shades available now are (from left to right) Pearl, Champagne, Pink and Rose Gold. I can wear Pearl and Champagne but the last two are too dark for me… though I’ll absolutely get use out of them as eyeshadows! 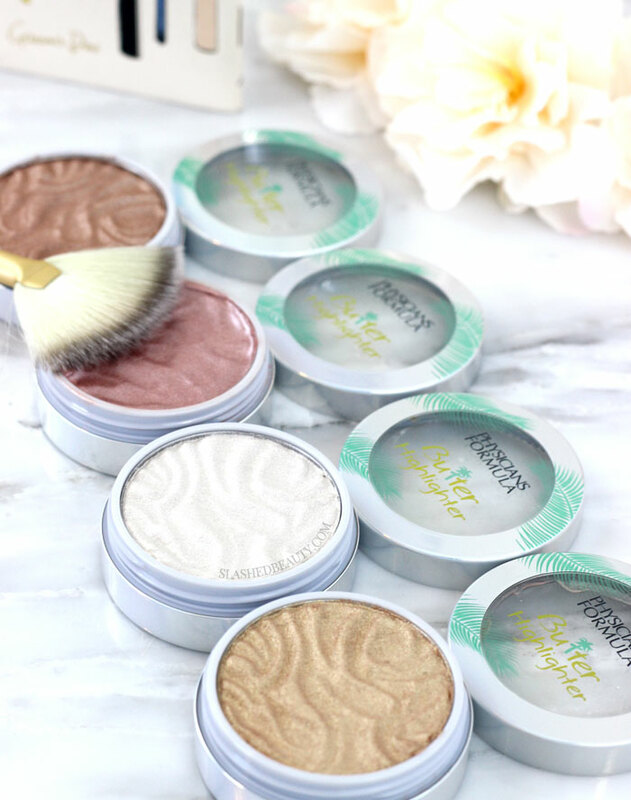 All of the “butter” products from Physicians Formula become super popular for their soft and blendable formula. These are no exception, though they do have a different feel than the Butter Bronzer and Butter Blush. These have a straight up mousse/cream texture that’s slightly softer than a ColourPop blush, for reference. If you press with moderate force, your finger with go through and hit pan. The Butter Highlighters contains Murumuru butter, Cupuacu butter and Tucuma butter that all soften, condition and moisturize the skin with fatty acids and pro-vitamins as you apply it. 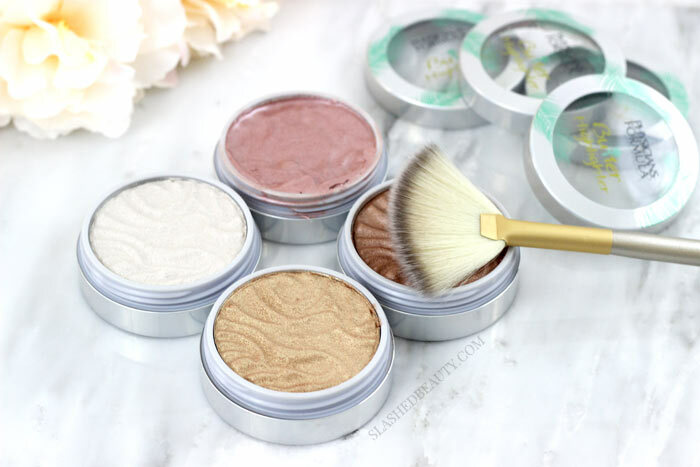 The cream-to-powder formula goes on smoothly and with a lot of color, and blends easily. There is very fine shimmer but mostly a beautiful sheen. It only takes a little bit of time for it to dry down to a powder finish. As they set, they don’t lose their soft focus look— I don’t feel like these accentuate any texture issues on my skin at all. This is so important for the fall and winter when we tend to get drier skin. These will keep tyou looking smooth and glowy. You can absolutely build these up to be intense, but here’s what they look like blended out to how I feel they’d be worn on the face. From top to bottom we’re looking at Rose Gold, Pink, Champagne and Pearl. As always, these highlighters are hypoallergenic and cruelty free. 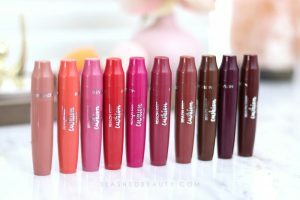 They are currently available for $10.95 on Physicians Formula’s website, but will be popping up in more drugstores this month. Which shade are you most gravitating to? Miranda, what would you compare these highlighters to in the higher end option? I’ve tried Becca, tarte, Kevyn Aucoin, curious to know how they compare. I’d say the texture is very similar to the Becca highlighters!! Very soft and smooth with lots of pigment! Oh! I don’t think I’ll be able to resist that pink! Although pale I guess I could wear it softly. I think these are going to be so nice! the swatches help so much. These are all really pretty. I’ll be looking for all of them. Now I REALLy want them! Love your photos of these highlighters! Now you’ve made me want to try a couple of the colors. 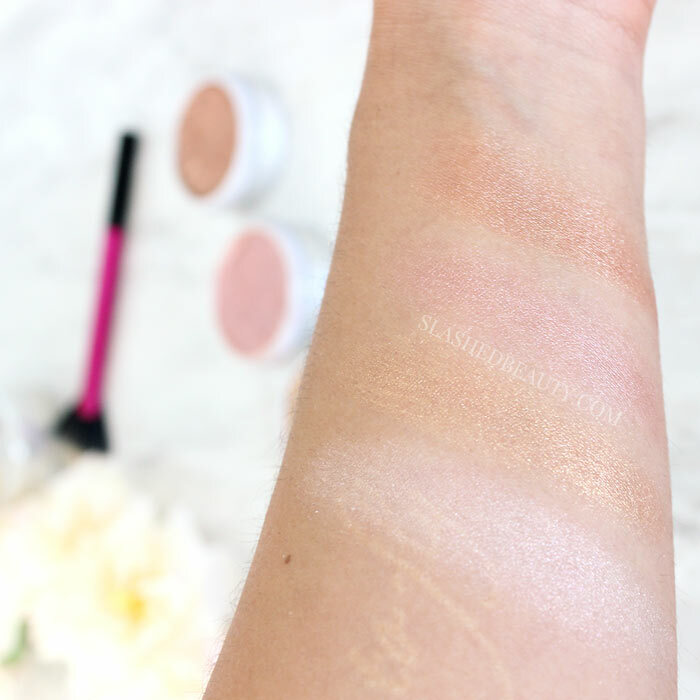 The swatches are so pretty on you, especially Rose Gold and Champagne! Pink and Champagne are the ones that I’ve eyeing! I would try these as a blush especially the pink. Sometimes PF has a fragrance, do these? I can’t detect anything than the scent that seems natural to the butters! These are so pretty! The Pearl and Pink are calling to me. These look intense! I will have to go stalk my Harmon/BBB!! !